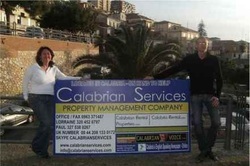 Myself Paul and partner Lorraine moved to Calabria in March 2008 from Spain where we were working in the property and property management service. As we saw the potential of the area we decided to promote the area with a publication which over time has become The Calabrian Voice. Since then we have evolved and had new members join us in editing and promoting the newspaper. Now in our third year we are growing and going from strength to strength.